An event that had me draw caricatures for students coming back to campus for a washington college. 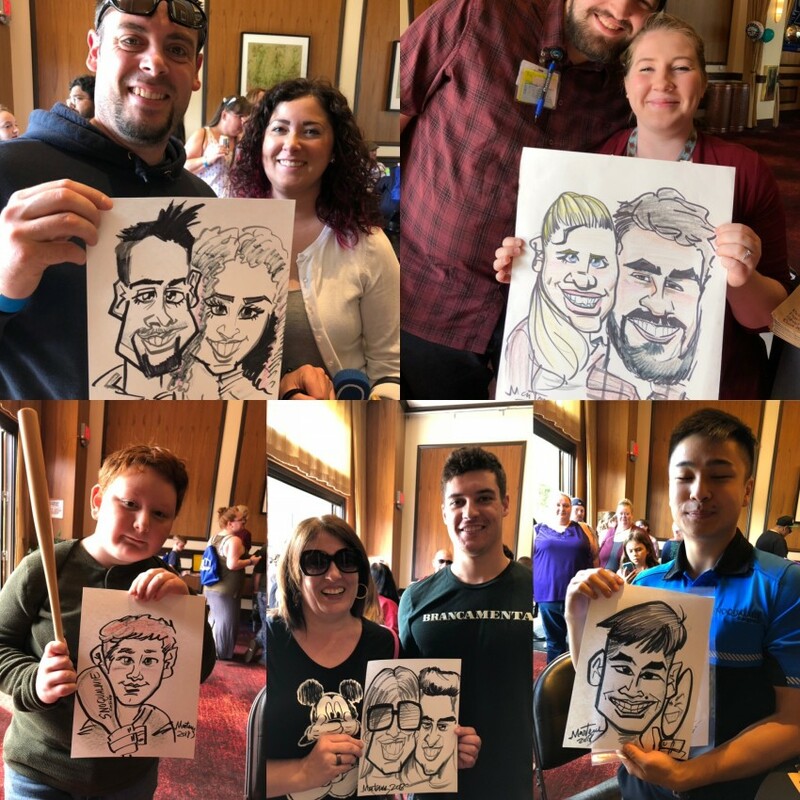 An employee celebration day for casino workers i did caricatures for back in September. A Wedding i serviced in May. Was a hit!!! Office Xmas Party! Who knew accountants could party so hard. Tons of beautiful faces to poke fun at! This group of office workers had some extremly fun faces to draw. So interesting & such variation! Wet-n-wild Kids birthday party where i got draw smiley faces. Party at the University of Washington. 4th of July Party with smiley faces! Company picnic for a famous video-game company last Summer! Hint: They looove mushrooms! I'm just a dude who really loves drawing, creating cartoons of people, and making them laugh. Caricature is a way to use my talent & artistry to deliver smiles to the masses. Hire me if you want to liven up a children/adult party, an event, a bar mitzvah, or any ol shindig you got goin. Ill do anything within a decent drive of Seattle/Tacoma/Everett & surrounding Puget sound areas, big OR small (100+guest). My rates start at $75 with a small deposit required. I do B&W and Color; Heads/Full Body; Themes & Large groups (6+ people at a time). I'm speedy, accurate, creative, and detailed in my technique. Most importantly, im just there for all to have a good time! Great artist and an even better personality! We hired Martenas to do portrait caricatures of our office employees, and we all loved them! His art style was consistent and he was very professional. Would definitely hire him again if the opportunity presented itself. Thanks, Martenas! I'm truly flattered, & feel blessed to have found such a great group of people to work with. You guys were the best, and Ryan was the prime example of a great host/contact for an event! Really loved that impromptu tour at the end as well Ryan. My heart is still pumping, but loved seeing the intricately designed architecture of your building none the less. :) Id gladly comeback should you guys be in need of my services again! Give your team my Best! 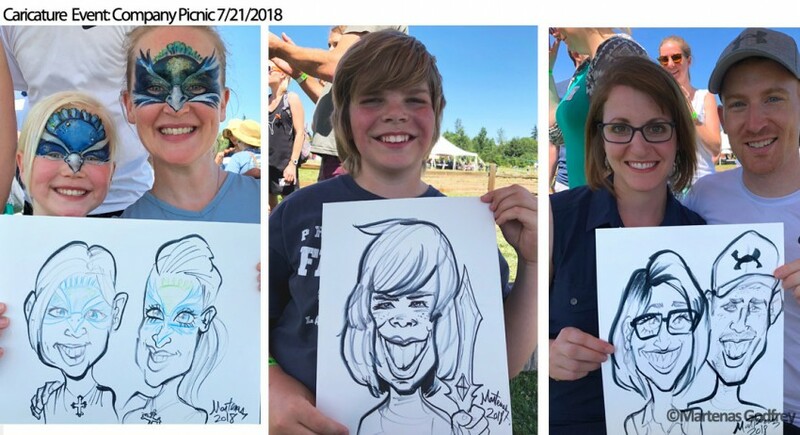 Thanks for the great caricatures! 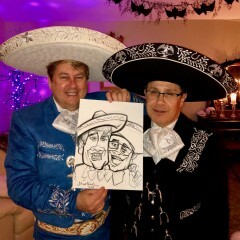 Thanks Martenas for the great caricatures at our holiday party! I appreciate the friendliness, and generosity of your guest, colleagues, and even a particular vendor that worked at the venue. ;) Being welcomed warmly is always the key to getting the best work out of me. Thanks for being so accommodating & professional. Cheers! Martenas clearly loves people -- he is very talented, friendly and draws amazingly quickly! He truly captured some of the guests -- others were less recognizable, but still wonderful. He communicated in advance and came on time. I highly recommend him! Martenas was professional, talented, and a pleasure to work with. 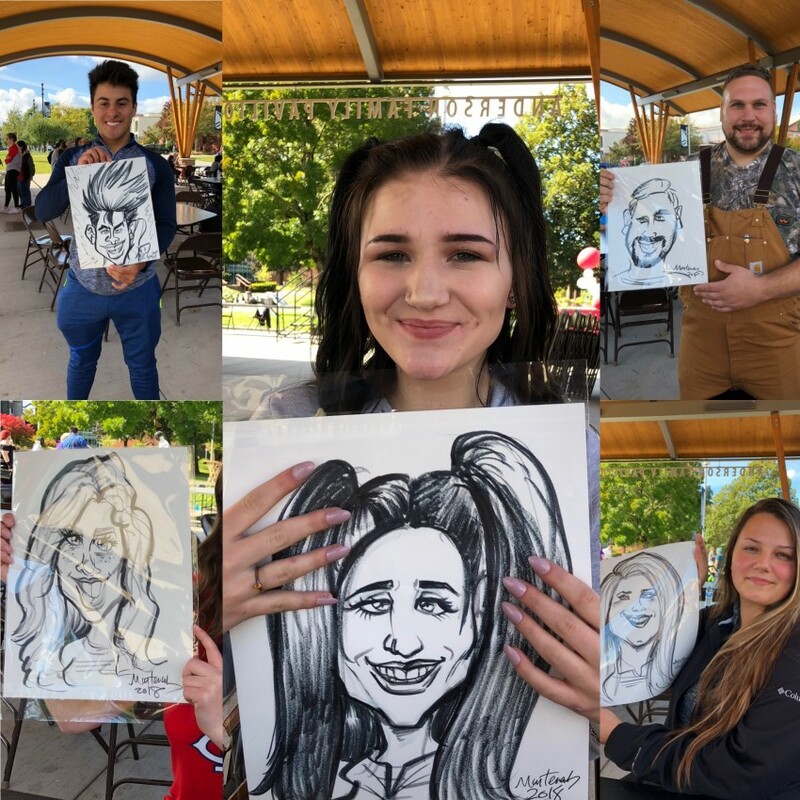 Our students and staff loved the caricatures! Thanks so much! It was my pleasure Paz. Should you guys need my services again, id be happy to come down and see you all. Martenas was a joy to have at our company event. Everyone loved his renderings and we would definitely hire him again in a heartbeat! Martenas was incredible for our son's 6th birthday party. His work was amazing and he was great with kids and adults alike. He blended into our party so naturally and was incredibly engaging with our guests. We would recommend him to anyone and very highly. Awesome attitude! Our family enjoyed him so much! We will most definitely have Mr. Martenas for our future events! Thanks Francisca. It was my absolute pleasure to serve you and your lovely family/guest, who were oh so generous & gracious to me. Call me back anytime. Martenas was delightful! He was so friendly and patient with my family that wanted to get their picture drawn! He was so great we paid him to stay an extra hour! Thanks Theresa for your kind words. The hospitality, and bubbly personalities were truly inspirational for the gratitude i could afford you. I loved how colorful, and diverse, and happy your family was. Trully a blessing to have been apart of your event. You and your guest are welcomed to contact me anytime for more. Thanks. On time and great service. We have used him before and appreciate what he provides. I just wanted to thank you for having me again Dustin. Your hospitality & generosity overwhelms me everytime. I am humbled to be of service, and appreciate the opportunity given. I can not put into words how thankful we are to have worked with Martenas. 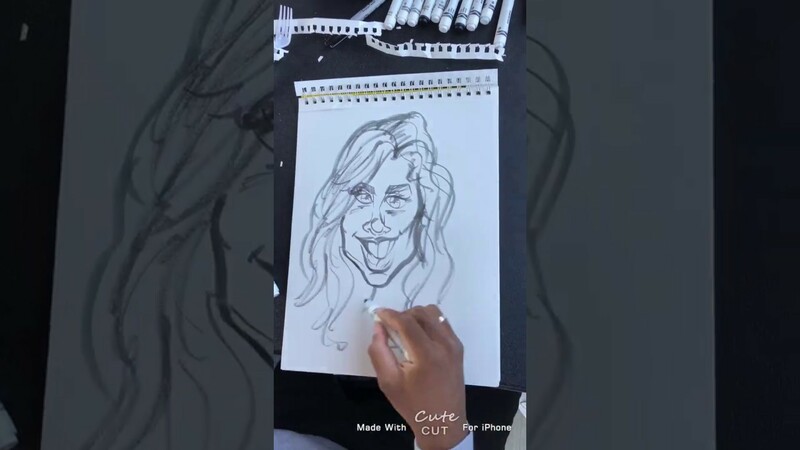 If you are looking for a caricaturist book him immediately! Aside from being so talented, he was incredibly accommodating, patient and his professionalism and kindness was truly a gift to us. We wanted our guests to have a great time (especially as most flew in for the wedding), and initially had Martenas booked for three hours - we quickly saw that he had a lineup the whole time and extended his time with us until the end of the evening. Most of our guests have sent us pictures of framed caricatures and have said that was their favourite favour from the wedding. I joke that we are trying to find other events to plan just to hire him! Recommend without hesitation, we are so incredibly thankful. Your thoughtful review, and kind words really warm my heart. I appreciate your endorsement, and would be honored to serve your guest in future events. I had a blast! Hope you guys had a fun honeymoon! So glad we were able to book Martenas on such short notice. He did such a great job and made my sons first birthday party an amazing experience. Thanks Estella. I too had a really great time at your sons first birthday. I really loved the atmosphere, and just seeing your family & friends having some good ol fashioned fun. The community & setting was also very peaceful and beautiful. Glad that i got to be a part of it! Martenas was great! We had him at our wedding as our party favor to our friends and family. All of the guests loved it and had so much fun with him. He was fun to talk to as he drew and it was something inquiring and different. We were very happy with the results and framed our picture. We had a mat made as our guest book and it is a great reminder of a wonderful day. I would highly recommend Martenas for any event!! Our expectations were exceeded and we will be using their services again. Thank you. Likewise. The level of respect, patience, generosity, and professionalism afforded to me by the host & guest at this event made it all the more easier to provide an exemplary experience for my customers. Thanks Dustin for being a great host. Will work with again. Martenas was hit of the party! Martenas was wonderful! Had a line the entire evening and the guests really enjoyed the pictures. Highly recommend him for any event! It was honor serving your guest, and being part of a brilliant event. Loved partying with your fun guest, and fellow vendors. I can tell you guys put great thought into your, present company included 😊. You and your guest were so patient, nice, fun, & generous. Will work with again. Had so much fun at our Holiday party. Martenas was a big hit, everyone enjoyed him and he did awesome drawings!!! Awww, shucks! Now I'm blushing. Thanks for the kind words. Really, I'm touched! I had a great time too. Cheers! Martenes arrived on time, was very friendly with our guests and the caricatures were very artistic! Martenas was a great addition to our 4th of July party! He is friendly, professional, and talented! Thanks again! And was a pleasure to work with Miquela and the whole staff at Brookdale! You guys were very generous and flexible with my needs. Thanks for all your kind words and support. Will work with you again. I wasn't able to be at the event, but all of the students who attended LOVED having Martenas there and said that he was a great addition to the event. They also said that his enthusiasm for the work showed and it made the activity fun! He was very friendly funny and fast ! He also drew very nice pictures my guests loved him ! Martenas was awesome! He connected with all the guest' and his artistry captured the personal aspects of each individual. We will definitely utilize his services again in the future. Thanks for your kind words Rose. I was able to perform to my optimal level because I was given such a comfortable working environment, and warm welcome. I was treated with courtesy, respect, and felt like i was part of the family. Being part of the festivities, the food, and your extended generosities, made working with you a pleasure. I would not hesitate to take the opportunity to perform at another one of your wonderful events. You'll get me, my artistic ability, and my can do attitude! You'll also be entertained and enlightened on the artist process. BTW...ill bring my own art supplies, a drawing pad, and a make-shift drawing table (if you dont have a table). All i really need is a well lite, safe, climate area to draw in. 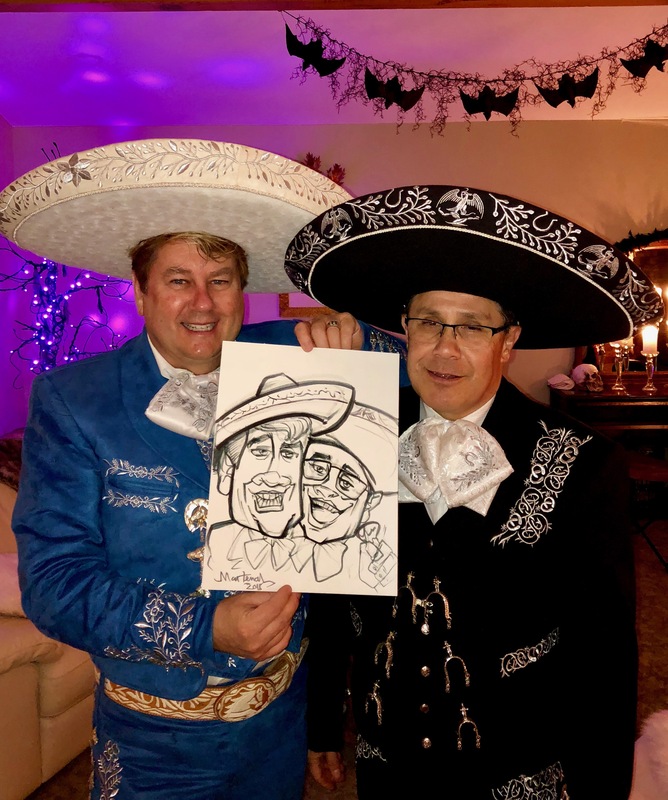 Caricatures can be fun, high-energy, and inject a bit of life in your party. It can also be a low-key thing for smaller bits of your crowd who are interested. It just depends on the mode of your event. I honestly just need a safe, clean, clear and sheltered section of your event. I also need great lighting. Lighting is key here. Also great seating arrangement for at-least 2. (one across from me) Chairs, and a decent table to draw on is a must. I do have my own portable drawing surface, but thats only in case of emergencies. I also need to be area to be dry, and reasonably temperate. This hands cant do much with a bit of chill in the air. I love the study of visual art, drawing. I have been influenced by many things in my life including; comics, cartoons, video-games, other artist, magazine artist. poltical cartoonist. ect.